The PrideA group of lions is called pride. Lions are the most social cats; each pride could include up to 40 lions. Each pride includes one or two males (sometimes more) and several females. Females are usually the ones that hunt for food. They rely on group work to hunt zebras, antelopes, wildebeests, and other animals.Males guard the pride’s territory, a distance that often stretches to about 100 square miles.Adult males in the pride drive away young maturing males. These males leave their pride and search for other prides that they could take over by defeating other males and killing or chasing away all male cubs. This cycle of new male lions chasing off other male lions and taking over a pride occurs often to any pride. A male lion should not expect to remain a leader in his pride for more than 2-4 years. Young females normally stay with their pride. A lioness can give birth to a litter of 1-3 cubs (sometimes more) every 2 years. Cubs nurse for about 6 months. However, they start eating meat at 3 months old. In the wild, about 3/4th of cubs do not live to become adults. 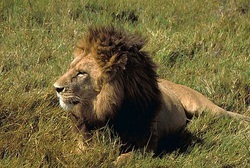 They die mainly from lack of food or attacks by other animals (including other lions that are not part of the pride). “It’s a Guy Thing—Testosterone!”Male lions are the ones with manes. The mane is their male pride. Studies have found that lions with longer and darker manes are more feared and respected by other male lions and have higher level of testosterone. Darker manes indicate healthier lions. General Lion Fun FactsA lion’s roar can be heard 5 miles away. Male lions usually weigh over 400 pounds; female normally stay below 300 pounds. Lions in captivity live twice as long as those in the wild (25-30 years in captivity; 15 in the wild). Thieves! Lions often steal hyenas’ or other animals’ kills. However, a large group of hyenas can sometimes steal a lion’s kill. Each adult lion needs 10-15 pounds of meat every day.